Founded by Tamar Bittelman z”l, memorial community garden in Tzvat reaches its “chai” birthday and new generations. There’s a precious community garden nestled between buildings on a crowded cobblestone street high up in the city of Tzvat, Israel. It began 18 years ago as a memorial community garden, in memory of a son who passed too soon, and it became a city landmark. Today this sacred place, enjoyed by and open to all, is receiving loving support toward renewing the shared space. First, a mother was seeking a way to honor her son who was killed by cancer as a teenager 20 years ago this past spring. Shirel Levine was considering planting a tree in his memory as she was grieving over her tremendous loss, as an American living in northern Israel. She met the wife of her doctor, and this righteous woman Tamar Bittelman (of blessed memory) expressed a deep compassion with Shirel for the loss of her son. Within 10 minutes of their first encounter, Tamar suggested a garden, and she offered to help set it up. Steven’s Garden in Tzvat was first established with much communal involvement. The grand opening involved the unveiling of a mural, live music, food and celebration. Tamar and her husband Noach built the first garden beds and then weekly taught local children how to plant and grow food there. The garden lived on, and has been maintained over the years at a low-cost for the benefit of the community. The author’s daughter from California visits the lemon tree that her kindergarten class donated to Steven’s Garden in Tzvat, Israel. Somehow Steven’s Garden reached me throughout the years as I reside in the Western US. When I lived in Tucson in the 1990’s, I knew Steven’s sister and so our mutual friend Susan Silverman – also a gardener – ecstatically informed me about this sweet community garden when she visited Tzvat some years later. I personally met Tamar Bittelman in 2004 when I moved to the East Bay in California where she was teaching kindergarten. It wasn’t until 2010 that I discovered Tamar was a founder of Steven’s Garden, when my daughter’s kindergarten class at Oakland Hebrew Day School raised funds as a tzedaka project for Steven’s Garden, and purchased a lemon tree that was planted there. 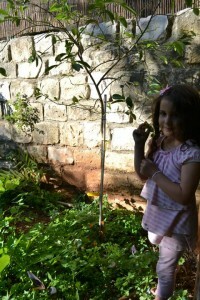 I visited Israel in 2011 for the only time ever with my children, and we visited the tree. Several young yeshiva bochers were enjoying the garden, sitting with their siddurim and chatting reclining on the bench under the mural. It was a joy to finally see this garden for myself, right across the street from the famous Kabbalah artist David Friedman’s studio. Tamar Bittelman was not only a kindergarten teacher but was also a co-founder of the Beit Midrash Ohr HaChaim, a unique unaffiliated independent Torah-learning center located in Berkeley, California from 1998 – 2012 under the spiritual guidance of Rabbi Herschel Yolles, the Samborer Rebbe z”l. Tamar started numerous gardens during her life, including a garden adjacent to Congregation Beth Israel in Berkeley before its renovation in 2004. Many of today’s Jewish environmentalists have met Steven’s Garden’s founder Tamar Bittelman. 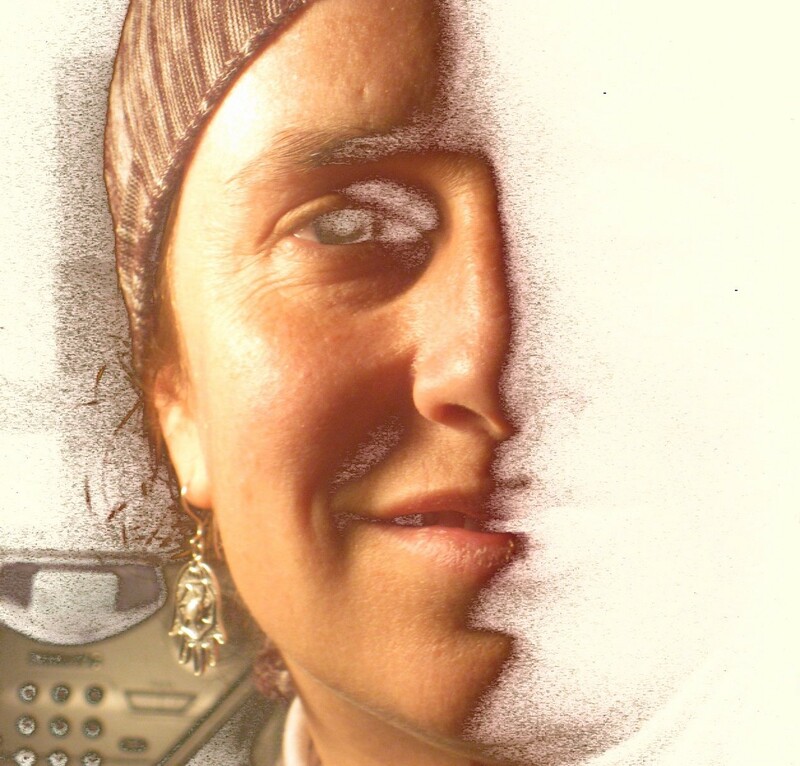 Tamar attended the 2011 Hazon Food Conference in Davis, California where her husband Noach Bittelman the Acupuncturist presented on Jewish health and spirituality, the Earth, and the Holy Land. One year after we attended the Food Conference, Tamar edited my first blog article for Times of Israel, where I recounted a special woman’s circle that we held at the Hazon event, in the broader context of women’s central role in redemption of the world according the Jewish tradition. Tamar and Noach Bittelman moved back to Northern Israel from California in 2012. During her last visit to Berkeley one year ago, Tamar was excited to learn of my newest project, a Hazon CSA which is in its inception stages and includes in its food security concept residential and communal gardens, and a pop-up kosher vegan soup and salad restaurant. She made an extra call to me during her trip to share her enthusiasm for Young Urban Moshav, and agreed to serve on the Board of Directors. Sadly, and to the shock of many who have declared her righteousness, Tamar passed away unexpectedly after returning to Israel, on a holy Shabbos during daavening 24 Shvat 5774 (January 25, 2014.) Tamar’s family has set up HaMorah Tamar Kindergarten Fund at Oakland Hebrew Day School in her memory. Tamar is buried in Tzvat, the same city in Israel where Steven’s Garden, which she founded 18 years ago, continues to grow. 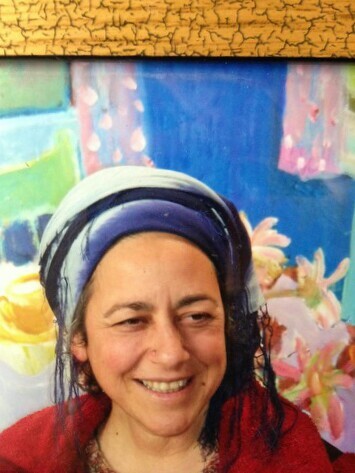 Steven’s mother described on Radio Free Nachlaot in August 2014 how others recount to her that they feel Steven’s beautiful energy in the garden. A memorial garden is an example of the environment as habitat outside our bodies for our emotion, spirituality, and communal sharing. It is a place of comfort and healing. Steven’s Garden holds the empathy of a woman hearing another woman grieving for her lost son, the generosity of creativity that builds and enriches the community, and comfort for mourners. It is a legacy of a grandmother and then granddaughter who loved, guarded and nurtured Eretz HaKodesh and the people of the land. Community gardens can serve many functions, and Steven’s continues to hold potential for many possibilities. With financial support from the people who cherish this special urban garden in Tzvat, Israel, Steven’s Garden can be renewed with new benches, upgraded irrigation and maintenance, and a new sign that will include Tamar Bittelman’s name as founder of Steven’s Garden. Contributions can be made through the end of this year’s high holiday season through the crowdfunding campaign on Indiegogo – click to learn more and contribute. Thanks for sharing this with us–what a wonderful way to pay tribute to someone who died too young–a garden is a living, growing thing that will continue to benefit others for years/decades to come. Thank you Gail! It is a very special place, built on love! I’m Steven’s mother and Tamar was my dear friend and inspired me to create Steven’s Garden. I’d like to get a new sign to memorialize both Steven and Tamar. I hope you will find it a worthy project to contribute to. It was created with love and brings peace and tranquility to the thousands of people who visit.